HOLA from sunny La Pintana, Chile. Team 1, all eight of us, have settled into our temporary home here at the House of Hope! Today is Wednesday, October 10, 2012. That means today is officially DAY 3 for TEAM 1. We welcome you to follow our progress in the days ahead as we seek to serve our gracious God who has allowed us to come to the House of Hope and minister to “our” girls! Monday, October 8, Day 1: This was NOT a sunny day; in fact, the morning truly was very chilly in Chile AND rainy. But God is good! The rain stopped. 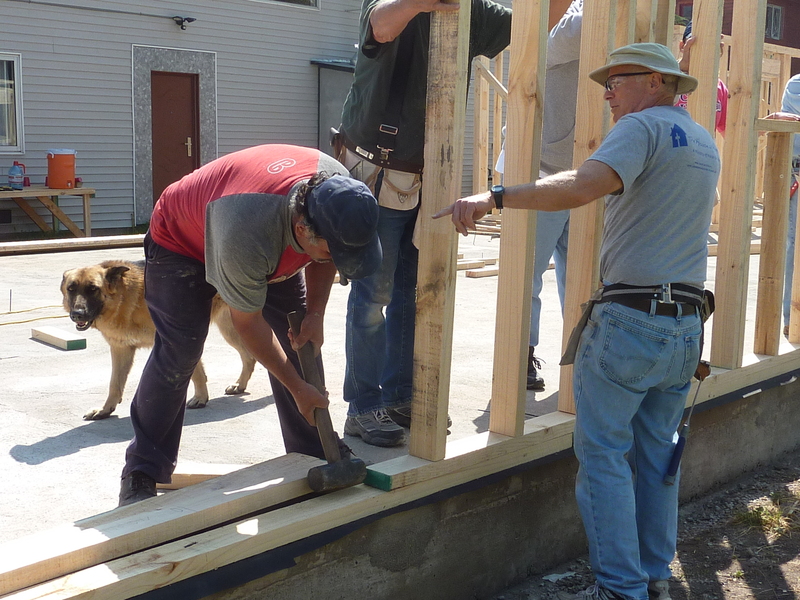 Bill cracked his whip and work was organized…AND by the end of the day, a wall was built and in place! Bob is at the chop saw while Tall Lee hammers away along with Short Lee. Rachel and Diane have carried many a 2 x 4 (wet, rough, full 2 x 4’s) and have been hammering as well. We are happy to have Willy working along with us, too. He is a joy to have working alongside of us. Tuesday, October 9, Day 2: A bright, sunny morning! With a smile on His face, God decided not to deliver necessary supplies for the Chilean sewer workers. SO, they decided that rather than standing around doing nothing, they would help build walls, too. When you have a relatively small team (but ready, willing, and able! ), any other bodies that are carrying wood are a true blessing! Our downside today: Diane, who is our intern at HoH and fellow team member for this month, was hit by a stomach bug and was out for the count! Pray for her health to return so she can return to her ministries here. Wednesday, October 10, Day 3: After our yummy, hot breakfast this morning, we were greatly blessed to have our morning worship team minister—Rachel, one of our team members, sings with Kathy Cerda and Lissette playing guitar (and singing, too). The girls are doing a wonderful job! Most of the girls are at school or involved in doing their practicum (student teaching, nursing, etc.) during the day. But when they ARE here, they can be found out at the worksite or helping in the kitchen, too! ALL of them make us grateful to serve them! By the end of today, it looks like ALL the exterior walls on the first floor may be standing! 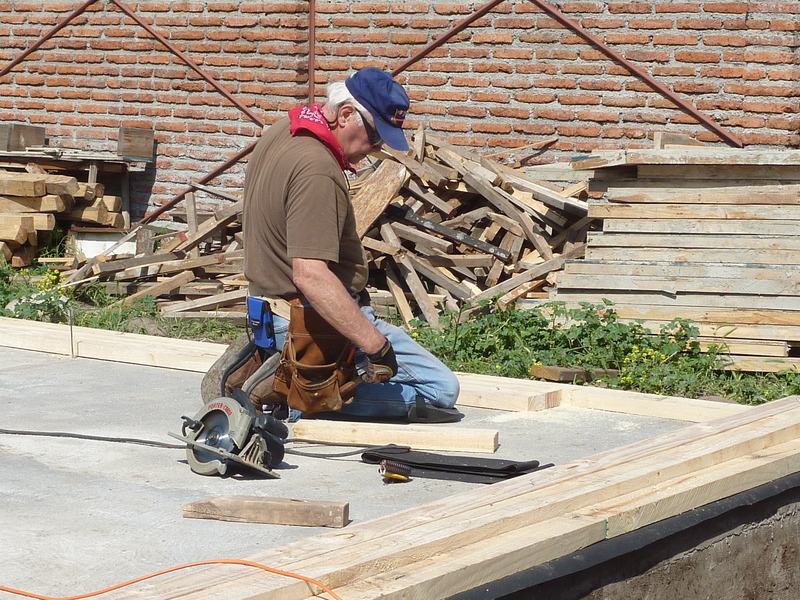 We even have El Jeffe Bill down on his knees working as the walls are laid out. Praise the Lord with us and we continue on—and you please continue to pray for safety, good working weather, wisdom and building relationships. We pray for our families and friends back home every morning—thanks to your prayers in return, we can be here doing what we’re doing! Next Post Vision for Chile Update 2.